A motorcyclist has been rushed to hospital after a collision on the A27. 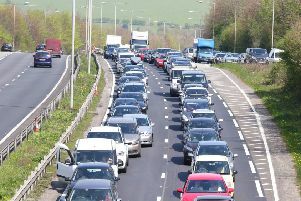 The incident happened at the A27 Sompting Bypass at 3pm today, which caused some traffic delays. Sussex Police attended the scene and confirmed that no other vehicle was involved in the collision. The motorcyclist had serious injuries and was taken to hospital by paramedics. One lane of the A27 was shut but it is now open again.